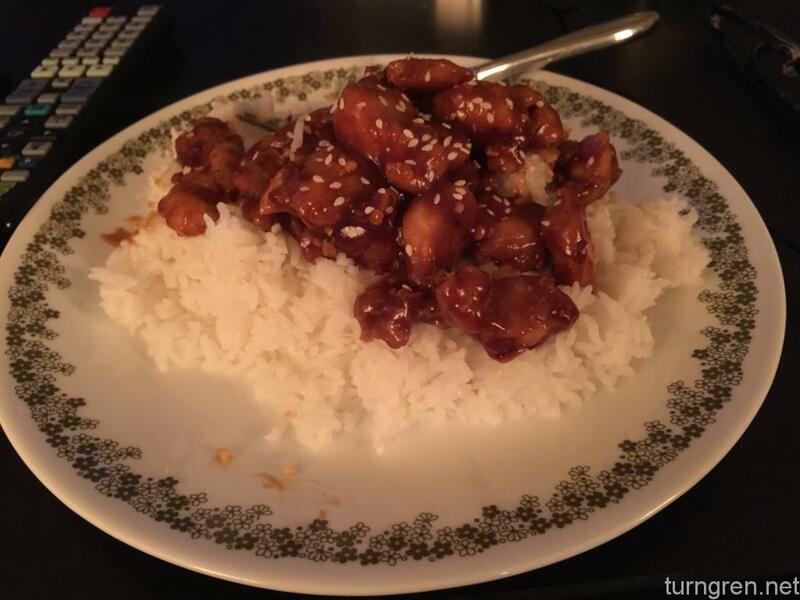 So I decided I would give this General Tso’s recipe a try. Took a little while to make, but was easier to cook than I was expecting. Rinsed and pat dry the chicken. Cut into 1-inch cubes. Heat oil in frying pan. Whisk together the remaining non-sauce ingredients, add the chicken cubes and mix around. When coated, shake of excess and add to oil. Brown this coating on as many sides as you can, until chicken is cooked through. Remove chicken, drain oil, and set aside. Mix sauce ingredients and add to hot pan. With the corn starch, this will thicken up pretty quickly. Then add the browned, crispy chicken and mix until heated up again. Pour over rice and top with sesame, and you’re done! Next time I think I will cut the chicken into smaller, but longer strips. I would like the chicken to be a little more crispy than it was. Other than that, I would add a little more heat in terms of red pepper flakes, but that’s just personal preference. I think mixing up the sauce ingredients the day before would also allow more of the pepper flavor to soak into the sauce. Also, I highly recommend this rice cooker I got on Amazon…it’s super easy. Dump 1 part rice to 2 parts water (up to 10 cups dry rice at a time) and press the button. 20 minutes later, you have that perfect chinese restaurant sticky rice. And it will keep it warm for hours. Previous Previous post: Cast Iron – Sizzle! Next Next post: Homemade Teriyaki is Easy!